This really excellent Shaw season is remarkable for many reasons but perhaps the most notable (at this particular moment in Canadian theatrical history) is its focus on and opportunities for women. They are muses (The Divine) and heroes (Peter & the Starcatcher), complex ingénues and feisty matriarchs (Pygmalion, The Lady from the Sea), scene-stealers (You Never Can Tell, IHO), stars (Sweet Charity) and the makers of their own fate (The Twelve Pound Look). And, in Top Girls, they’re everything. 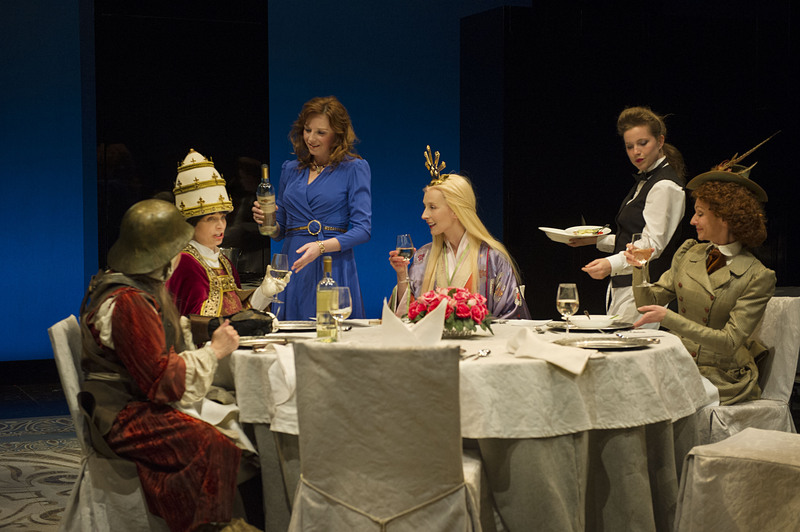 The confusing and random but very intriguing first scene of Caryl Churchill’s deceptive domestic drama is a dinner party largely unconnected to the riveting and naturalistic story to follow. Guests at the party include Isabella Bird, Lady Nijō, Dull Gret, Pope Joan and Patient Griselda- important female figures throughout history and folklore. They share their stories, their hopes and their resentments. They undermine each other and talk over each other as they fight for power and attention. There is, in this first scene, no star. Instead, there is an ensemble of power players each with the ability to headline her own show, an ensemble of remarkable women for each of whom the Shaw has found worthy roles year after year. I love the men of the Shaw but, left in the hands of Fiona Byrne, Catherine McGregor, Julia Course, Laurie Paton, Claire Jullien, Tara Rosling and Tess Benger for two and a half hours, I didn’t miss them at all. The rest of the play is about two women and the daughter who unites and divides them. It’s theoretically simple and complexly personal, anchored by superb performances from Course, Byrne and Rosling, the latter so understated and quietly sad that I was reminded of how little her usual grand roles reveal of her astounding range. Though Churchill’s play is admittedly disjointed, director Vikki Anderson beautifully marries the disparate pieces with an insightful dressing room frame, allowing the audience into the process as each woman “puts on her face”, so to speak, to become feminine icons (McGregor is corseted and bustled as a 19th century explorer, Course powdered and wrapped as a 13th century Japanese concubine). It’s an intriguing intellectual idea to accompany the dizzying first scene, clarifying its thematic purpose. There’s still not much more than tenuous links of female identity and the face we present to the world to link the two plays that present themselves as two parts of one whole but both are differently rewarding.